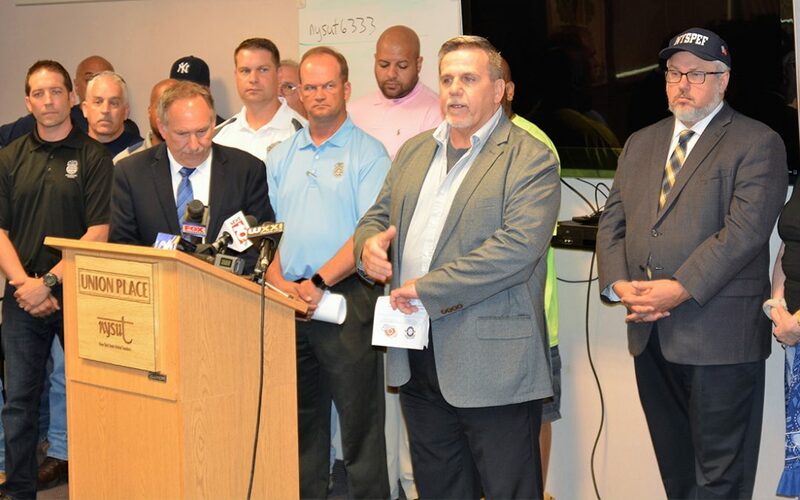 ROCHESTER – June 21, 2018 – At a press conference, union leaders in Rochester pushed back against the firing of the City’s Labor Relations Manager and Mayor Warren’s attacks on police, firefighters, and public employees. On June 20, Labor Relations Manager Amorette Miller was terminated from her position. Ms. Miller served as the liaison for City Hall in its negotiations with employee unions. Given her constructive working relationship with labor leaders, the firing of the City’s Labor Relations Manager is the latest sign that the Warren Administration is ramping up its attacks on unions. The removal of Miller from her position came less than 24 hours after City Council approved the Mayor’s budget that will result in greater inefficiency at the Department of Environmental Services. Although they could not attend the press conference, local leaders from CSEA – which represents City Librarians – expressed their solidarity. Labor leaders said they are more committed than ever to stand up for our workers’ rights and will forcefully respond to any attack on our unions.